Please be advised there is a water break at the monument area located close to the band office. 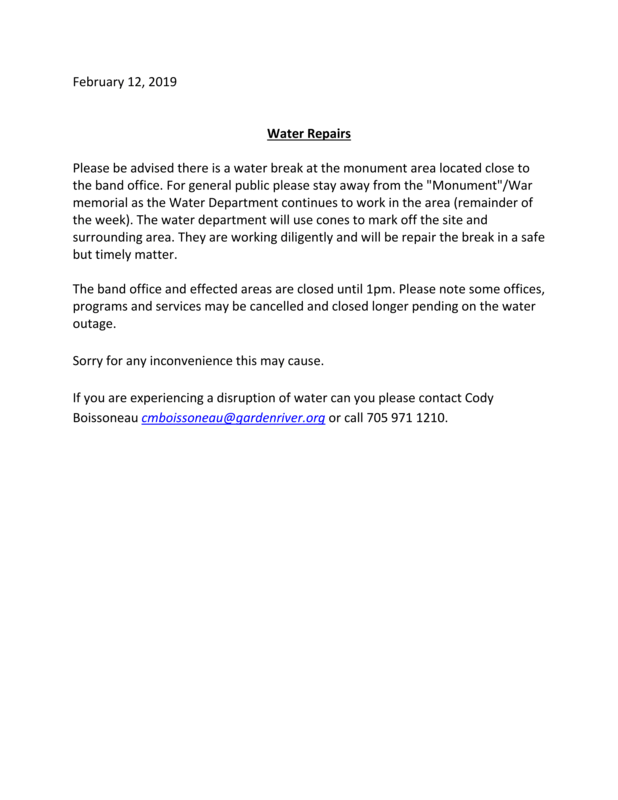 For general public please stay away from the "Monument"/War memorial as the Water Department continues to work in the area (remainder of the week). The water department will use cones to mark off the site and surrounding area. They are working diligently and will be repair the break in a safe but timely matter. The band office and effected areas are closed until 1pm. Please note some offices, programs and services may be cancelled and closed longer pending on the water outage. If you are experiencing a disruption of water can you please contact Cody Boissoneau cmboissoneau@gardenriver.org or call 705 971 1210.